KOWLOON CITY NIGHT FOOD TOURNEW! 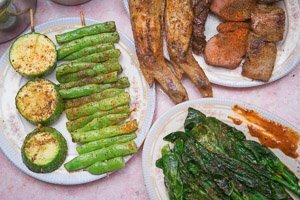 SHAM SHUI PO’S BEST OF HONG KONG FOODSNEW! Ready to eat like a local? 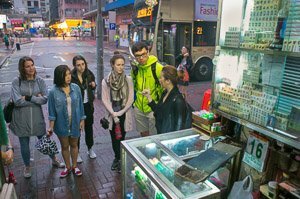 With that, we will whisk you away from the main tourist hot spots (ahem, Mong Kok) and take you to a neighbourhood that no tourist has gone before for an off-the-beaten path experience. Basically, we’re going to places you can’t find on Google. 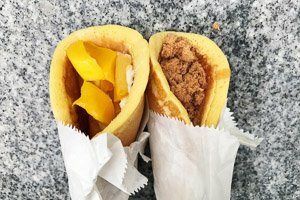 This Hong Kong walking food tour is ideal for those that already have had exposure to Cantonese food and are looking to discover foods that are outside of their tour guide books. This is the intermediate/elevated food tour to the Hong Kong Must-Eats Food Tour, which is our introductory food tour to Hong Kong foods. 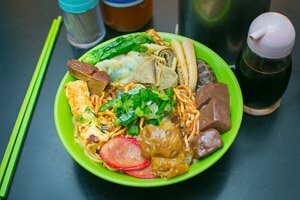 The Off-the-Eaten-Path Street Food and Authentic Eateries’ objective is to provide you with a more in-depth understanding into the different flavours of Hong Kong cuisine and to feast on the more common day-to-day foods that locals love to eat. If you’re looking to eat like a local, this is the tour. * Please see our Fishballs’ Food Adventurous Scale to see why this tour has been rated a 3-4. Whampoa MTR station, outside of Exit C2. Look for the human with the moose antlers. Meeting point photo. Whampoa MTR station, outside of Exit A.
Vegetarian & pescatarian menus available. Please notify us during booking. 2 guests minimum to run the tour. 12 guests maximum. We will go to 6 different tasting locations and sample over 10 different local eats. The locations are varied from hole-in-the-walls, to street vendors, to seat-down restaurants for a true local experience. The food tour eats like a progressive meal starting with an “amuse bouche” to desserts at the end, tasting the spectrum of Cantonese flavours from bitter to sweet with spicy, sour, & salty in between. Please eat very light before this gluttonous food tour. PLEASE NOTE: Tastings may change without prior notice due to availability. Most auspicious Kwun Yam temple in HK? The Off-the-Eaten-Path Street Food and Authentic Eateries Food Tour has been rated a 3-4 on our Fishballs’ Food Adventurous Scale due to the fact that we’ll be in a local residential neighbourhood, eat at hole-in-the-walls and you have the option to get the “weird stuff” such as pig’s intestines & blood, etc. as toppings on one of the stops. 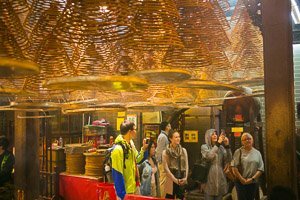 We recommend guests to have at least a preliminary knowledge and exposure to Cantonese foods prior to taking this tour so you get the full value of it. 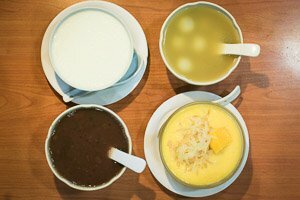 Our Hong Kong Must-Eat Foods would be a good food tour to start with if you’re looking for the basics. READY TO BOOK? FEELING IT YET? 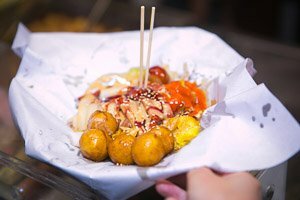 You like the sound of the Off-the-Eaten-Path Street Food and Authentic Eateries food tour, but prefer to make it a private tour so it’s just your group and the guide for greater flexibility and intimacy? Not a problem. We can make it happen for you. YES! That’s what we like to hear. We tend to sell out a few weeks’ in advance so make sure you book early to avoid disappointment. Don’t say we didn’t warn you. Think you’ve found the perfect gift? We think so too. Gift them this specific tour or a specific dollar value to put towards a tour. They’ll think it’s the most fabulous gift ever, and it took you all of 30 secs. It really is that easy and who doesn’t love the gift of delicious food? Always get a receipt as it has the taxi’s info in case you forget something in the taxi. The most convenient way. Whampoa is just 20 mins by MTR from Central; 3 MTR stops (10 mins) away from Mong Kok; and 15 mins away from Tsim Sha Tsui. 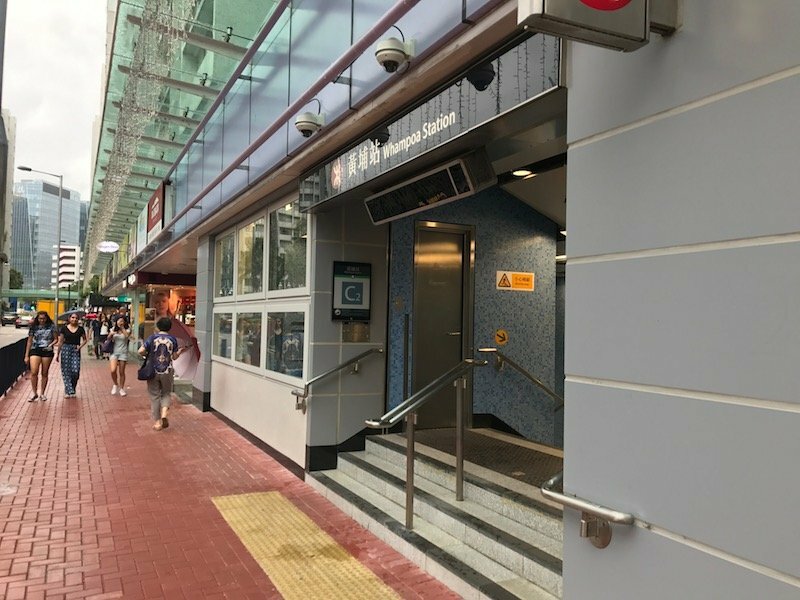 Whampoa is the first/last stop located on the Kwun Tong MTR (green) line. If you’re on the Hong Kong Island side, ride the Tsuen Wan MTR (red) line to Yau Ma Tei to transfer to the Kwun Tong MTR (green) line. There’s a ferry that goes from the North Point ferry pier on Hong Kong Island directly to the Whampoa ferry pier. It’s only a 10 min. ferry ride; however, the ferry has only 2 sailings per hour. Please check the timetable here first. It’s about a 5 min. walk from the ferry pier to the meeting point. Whampoa is easily accessible by minibuses (the green or the red variety) & buses. We do feel that unless you are a seasoned pro, it’s probably easiest to take the MTR, which is the way we recommend getting to Whampoa. On the ground traffic in Hong Kong is a bit of a hit-or-miss. We require a minimum of 2 guests to run the tour. If min. numbers are not met 48 hours prior to the tour, you’ll be notified via email, and the full refund and final confirmation will be sent via email to you 24 hours prior to the tour date and time. Sometimes plans change – we get it. We also have a minimum numbers requirement in place so our refund policy is as flexible and fair as we can make it without disrupting our vendors and other guests due to refunds. Please be considerate and let us know as soon as you can if you won’t be making it to the tour. Please view our Refund Policy here. We go rain or shine! That is, when it’s physically safe for us to do so. We have a Bad Weather policy in place in case of situations such as when Rainstorm and/or Typhoon signals are hoisted. Please read our Bad Weather Policy here. WE HAVE A 99% 5* STAR REVIEW RATING. THAT’S HOW WE WOK ‘N’ ROLL! This tour was so much fun. Our guide took us to local places that we would not have tried or known about. The tour was a great mix of food and cultural information and Whampoa was a lovely neighbourhood to do this in! Our guide was a fantastic guide, was very helpful, chatty and answered all of our additional questions. She’s a hit with the locals as well – I loved to see her bantering with them all. Would definitely recommend this tour, get yourself to Whampoa with Humid with a Chance of Fishballs! FUN & KNOWLEDGEABLE ENGLISH SPEAKING GUIDES! If you love food and you want to get off the well-worn tourist trails, then Humid with a Chance of Fishballs should be your first choice. My husband had his ‘villains hit’ by one of the infamous ‘cursing grannies’, before we boarded a tram and travelled to our Sampan boat for delicious shellfish, including the re-nowed ‘Typhoon Shelter Crab’. 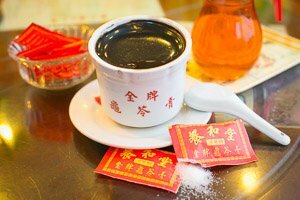 The next day our guide guided us to one of the oldest dim sum restaurants in town, taught us how to get a seat – no, really, you’ve never done this before, I promise you! No easy feat, I can assure you! I can highly recommend Humid With a Chance of Fishballs! After a quick introduction we turned a few corners and found ourselves in the middle of the hustle and bustle of the back alleys of Hong Kong. Amidst a myriad of different food options she seems to be able to find the ones that offer that little bit extra. Our guide seemed to have a genuinely great rapport with the hawkers and food stall owners we visited. 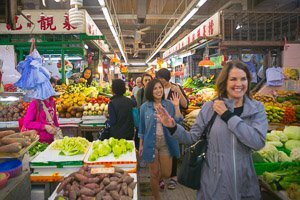 If you’re looking for a genuine, authentic urban experience, we can definitely recommend going on this food tour. All we suggest is you bring an open mind and a healthy appetite; there’s going to be plenty of food and some of it will have you talking about it till late in the evening. WARNING: GLUTTONY AHEAD. FOOD BABY GUARANTEED. PROCEED WITH HUNGER.